Gaspé is a city at the tip of the Gaspé Peninsula in the Gaspésie–Îles-de-la-Madeleine region of eastern Quebec, Canada. 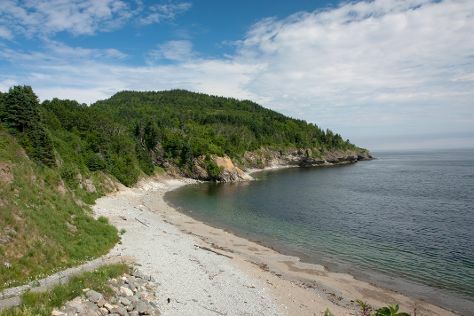 Explore the numerous day-trip ideas around Gaspe: Phare-du-Cap-des-Rosiers (in Cap-des-Rosiers), Perce (Magasin Général Historique Authentique 1928, Perce Rock, & more) and Miscou (Miscou Island, Plage Isle Miscou, & more). Spend the 26th (Fri) exploring nature at Forillon National Park. Next up on the itinerary: make a trip to Pierced Rock (Rocher-Perce), admire all the interesting features of Le Domaine du Centaure, enjoy the sea views from Pointe-a-la-Renommee, and see the interesting displays at Site d'interpretation de la culture Micmac de Gespeg. For where to stay, more things to do, photos, and tourist information, use the Gaspe vacation builder. Calgary to Gaspe is an approximately 16-hour flight. Due to the time zone difference, you'll lose 2 hours traveling from Calgary to Gaspe. May in Gaspe sees daily highs of 16°C and lows of 2°C at night. You'll set off for Calgary on the 23rd (Fri). Known as the "Stampede City" thanks to its world-famous annual rodeo, Calgary remains a tale of two cities. Explore the numerous day-trip ideas around Calgary: Canmore (Mut Hut Pet Emporium Inc., Canmore Museum and Geoscience Centre, & more), Banff National Park (Johnston Canyon, Sunshine Village, & more) and Banff (Lake Minnewanka, Bow Falls, & more). Next up on the itinerary: admire nature's wide array of creatures at The Calgary Zoo, take in panoramic vistas at Calgary Tower, contemplate the long history of Fort Calgary, and see the interesting displays at Royal Tyrrell Museum. For where to stay, photos, maps, and other tourist information, refer to the Calgary vacation builder. The Route module can help you plan travel from Gaspe to Calgary. You'll gain 2 hours traveling from Gaspe to Calgary due to the time zone difference. In June, plan for daily highs up to 22°C, and evening lows to 9°C. Wrap up your sightseeing on the 21st (Fri) to allow time to travel back home.